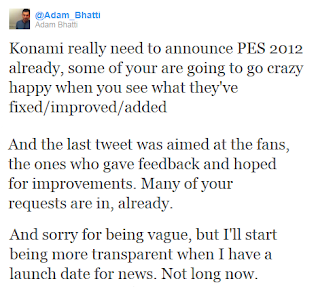 "Konami Need To Announce PES 2012..."
Adam Bhatti (I don't think I need to introduce him again?) 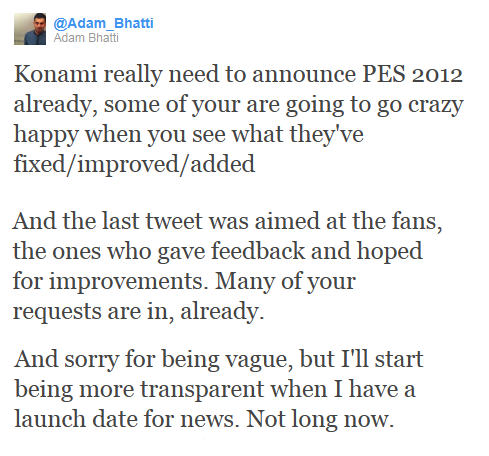 has started dropping PES 2012 bombs all over Twitter recently. EA released the first FIFA 12 screenshot on Tuesday (via FSB), so it's only a matter of time before Konami announce Pro Evolution Soccer 2012. We're expecting a phone call or two from Adam this week, so we will also be able to have the joy of gaining the ability to drop tweet-hints such as these too! - As for the spelling mistake, I will assume that's down to Adam being unable to contain his excitement when typing out the tweet. Perfectly understandable.